Many children have a fear of dogs. While being wary around dogs make sense, children who are extremely frightened of dogs may have a hard time going to the park or visiting a friend who has a dog. 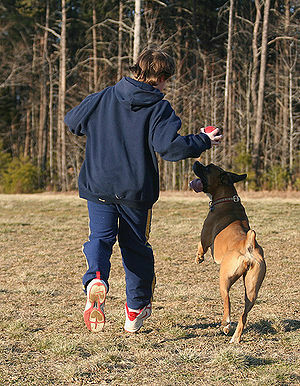 Fear of dogs is sometimes triggered by an event, such as a dog jumping on a child and scaring him or her. Sometimes the children are picking up on their parents’ nervousness around dogs. Occasionally, it is impossible to pinpoint a specific reason which is causing the fear. There are a number of ways to teach a child to overcome this fear. You want to gradually desensitize your child. Start by reading books about dogs, talking about dogs and asking your child to describe his reactions and feelings when he sees one. You can then visit a pet store and look at dogs from afar or visit a friend who has a calm dog. You can model appropriate behavior by gently touching the dog and talking softly to him. If your child is willing, she can let the dog sniff her hand or even pet him. Stop when your child shows signs of distress and try again another time. It’s important to teach your children how to behave around a dog. They should know that they should not shriek, run away, or bother a dog when he is eating, as all these actions are likely to provoke aggression. They should learn that if a dog jumps up or scares them, they should stand still like a tree and not react in any way. It is equally important not to laugh at your child or humiliate him because of his fear of dogs. This will be hurtful to him and will not bring you closer to your goal of overcoming the fear. Make sure you are not passing your own fear of dogs on to your children, whether by words or by actions. 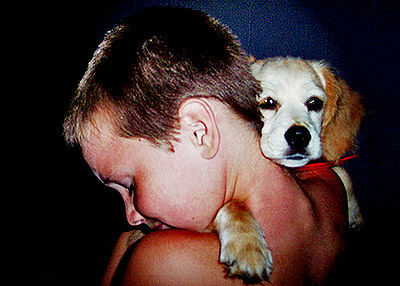 Don’t be surprised if your child’s fear of dogs dissipates with maturity. You may find that the child who was so scared at a younger age starts begging you to adopt a dog when he gets older!